DMRC Full Form: Delhi Metro Rail Corporation commonly abbreviated as DMRC is a centre-state public sector firm administrating the functioning of Delhi Metro Railways. DMRC conducts recruitment exams every year to appoint various officers for internal vacancies. Recruitment Exam Purpose: DMRC hires various executive and non-executive officers for different roles and responsibilities. The recruitment is done for both regular basis and contractual employees. Examination Level: It is a National level exam conducted by Delhi Metro Rail Corporation. About DMRC: Delhi Metro has been instrumental in introducing another time in the circle of mass urban transportation in India. The swanky and present-day Metro framework presented agreeable, aerated and cooled and eco-accommodating administrations without precedent for India and totally changed the mass transportation situation in the National Capital Region as well as the whole nation. Headquarters: DMRC is headquartered at Delhi Metro Rail Corporation Limited, Room No.1, Block B, Ground Floor, Delhi Metro IT Park, East Approach Road, Shastri Park, Delhi-110053. Section A (Regular-Executive): 20,600 to 46500 (per month). Section B (Regular-Non-Executive): 14000 to 26950 (per month). Section C (Executive-contract based): 20,600 to 46500 (per month). Section D (Non-Executive- contract based): 14000 to 26950 (per month). Notifications: DMRC Recruitment 2019 notification is expected to be released in January 2019. Application form: The application window is expected to open in April 2019. The notification regarding all the dates is expected to be released in January 2019. Date of Examination: The DMRC exam date 2019 is expected to be scheduled a month after the application window opens. Check all DMRC Exam Dates 2019. Job Posts: DMRC exam 2019 will be conducted to hire eligible candidates for various executive and non-executive posts (regular and contractual). Vacancies: The total number of vacancies will be notified in the official advertisement of DMRC Recruitment 2019. Candidates can expect the notification to be released by January 2019. In 2018, DMRC had released a total of 1895 vacancies. Reservations will be provided for SC/ST and OBC candidates. Educational Qualification: The candidates/applicants must have obtained a graduate degree in any discipline from a recognized University or any equivalent qualification recognized as such by the Central Government to satisfy the DMRC eligibility criteria for the 2019 exam. Age Limit: The applicants must not be less than 18 years of age. The upper age limit for applicants is 28 years. Read all about the detailed DMRC 2019 Eligibility. Subjects: The syllabus for the recruitment exam in 2019 will include: General Awareness, General Intelligence & Reasoning, Quantitative Aptitude (General English for Maintainer-Electrician, Electronic Mechanic, Fitter, and Ref & AC Mechanic) and/ knowledge of the discipline/trade. Post specific: General Awareness, General Intelligence & Reasoning, Quantitative Aptitude will be common for all applicants and the applicants will also be assessed on questions related to the post/discipline of work they apply for. Find more details on each topic of DMRC 2019 Syllabus. Structure: The DMRC Recruitment Exam 2019 will be conducted online (computer based test) on the specified DMRC exam date 2018-2019. The Paper-1 will have 120 objective type questions. The total time to complete the test will be 1 hour 30 minutes. Paper-2 will have 60 objective type questions and the test will be conducted for a duration of 45 minutes. Post-exam process: Candidates qualifying the online test will be invited for a Personal interview with DMRC. Note: For certain posts, the marks obtained by the candidate in GATE 2018 will be considered. DMRC uses GATE score as an eligibility criteria for the recruitment of specific employees. Check the detailed DMRC Exam 2019 Pattern. Mode of Application: Candidate needs to visit the official website of DMRC (http://www.delhimetrorail.com) to fill their recruitment application. Application Fee: DMRC exam application fee of INR 500/- (exclusive of bank transaction charges) is non-refundable and all SC/ST/PWD & women candidates will be required to pay a non-refundable fee of Rs. 250/- (exclusive of bank transaction charges). Find step by step instructions for the DMRC 2019 Application Process. Release Date: Candidates need to visit the official website of DMRC to download DMRC exam Admit Card 2019. The Admit card will be issued to the applicants/ candidates two weeks before the exam. An exact date will be notified by the authority in January 2019. Download: The candidates will have to submit their application number, date of birth and security pin to download DMRC exam Admit Card 2019. 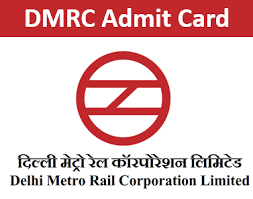 Know all about the DMRC 2019 Admit Card. Released on: DMRC exam 2019 Results will be released on the official website (delhimetrorail.com/career). Release Date: DMRC will announce the results of 2019 recruitment exam 3 months after the conduction of the exam. Read in details about how to download DMRC Exam 2019 Results. Q. Will the applicants need to send a hard copy of the application form/uploaded documents by post to DMRC? Ans. No, applicants will be required to only upload necessary documents online. The duly filled in online application form is not required to be sent via post. Q. After filling the application form, if the print out of the registration slip could not be taken for some reason, can one still obtain it online later? Ans. Yes. The applicant can download the registration slip later. It will be available on the official website and can be printed out later. Q. Can I apply for multiple posts? Ans. Yes. If an applicant satisfies the eligibility criteria for the concerned posts, he/she can apply for all such multiple posts. Q. I am a student belonging to the OBC category. However, I chose the general category by mistake when filling the application form for DMRC Recruitment Test. Can I correct this mistake? Ans. Note that there will be no application form correction window for DMRC recruitment exam. The details in the application forms once submitted cannot be edited or modified. So, the candidates are advised to fill up the application form correctly and verify the details before submitting it. Q. If the Final result/ Mark sheet of the qualifying degree examination is not available with the candidate due to a delay in announcement of results., can the candidate still apply for the exam Is such a candidate eligible for DMRC Recruitment Test 2018? Ans. Yes. Applicants who are awaiting their final semester/year results and engineering exam schedule 2019 can apply provided they can present a proof of passing at the time of final employment. Q. When will be the registration slip available for taking a print out? Ans. The candidate must wait for a minimum of two days after paying the application fees. Q. Can I view the registration number again if I didn’t note it during the application process? Ans. Yes, it can be retrieved later from the website using the concerned link. The candidate’s email-ID and DOB shall be required for login. Q. Can a graduate apply for Customer Relations Assistant without having computer literacy (Computer Application Course of a minimum 6 weeks duration course from reputed Computer Training Institute) on the date of application? Can I apply for Customer Relation Assistant post and obtain Computer Application Course of a minimum 6 weeks duration course after applying for this post? Ans. Yes, You can apply for Customer Relations Assistant post and you can obtain a Computer Application Course of a minimum 6 weeks duration course thereafter but the condition of making your application eligible for the post will be subject to production of proof of having passed eligibility qualification (Certificate in Computer Application Course of minimum 6 weeks duration) on the date of interview. Q. I have done 4 years B.Tech. /B.E. in Electrical/ Electronics/ Mechanical/ Civil Engineering, Can I apply for the post of Junior Engineer (Electrical/ Electronics/ Mechanical/ Civil)? Q. I have done 4 years B.Tech. /B.E. in Electrical/ Electronics, Can I apply for the post of Station Controller/ Train Operator (SC/TO)? Q. Can the age of candidate be rounded off to the lower limit? Ans. No, The age cannot be rounded off to the lower limit. Q. When will the written test be held? Ans. Schedule for Written Test/ Interview test will be notified only through DMRC website. The Candidates are advised to visit our website regularly pertaining to this Advt. Refer Selection Process column in the Advt. for details. Q. Whether NOC has to be obtained for applying by the applicants from Ex-Serviceman/ PSUs/Govt. Departments? Ans. Candidates from Ex-Serviceman / PSUs / Govt. Departments are required to obtain NOC. NOC will be verified at the time of interview for qualified candidates. Q. Where will be the Written Test center? Ans. Only in Delhi & NCR. Q. Whether OBC certificate in the state government Proforma allowed? Ans. No, OBC certificate should be in the format prescribed for employment under the government of India and the same is given in Appendix II in the “Eligibility Criteria and Other Details” on the website. Q. Can I apply for more than one post? Ans. Yes, You can apply for more than one post as per your qualification. However, you must note that the written test for some posts may be held on one single day depending upon the volume of applications received.